Baby wipes have been a part of my life for over a decade. Over the course of 10 1/2 years and 4 kids, I learned that there are many more uses for baby wipes than just wiping little bums! Because Kids Outgrow Diapers, Not Messes*. 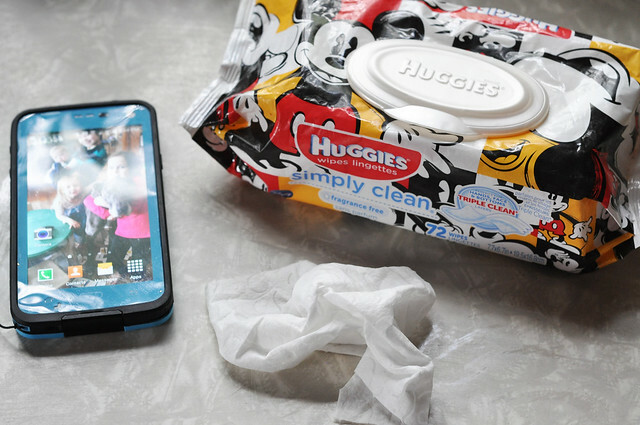 Shortly after having my first child in 2004, I became a huge fan of Huggies® Wipes! I used them for everything. 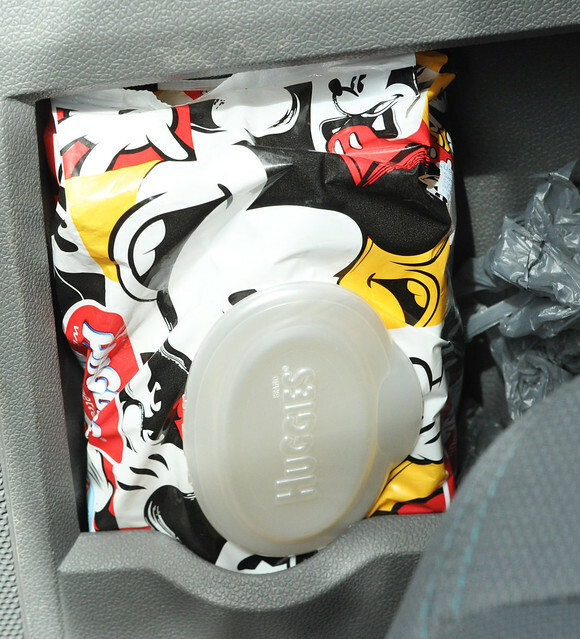 I had wipes stashed in every room of my house, in my diaper bag, and in my car! 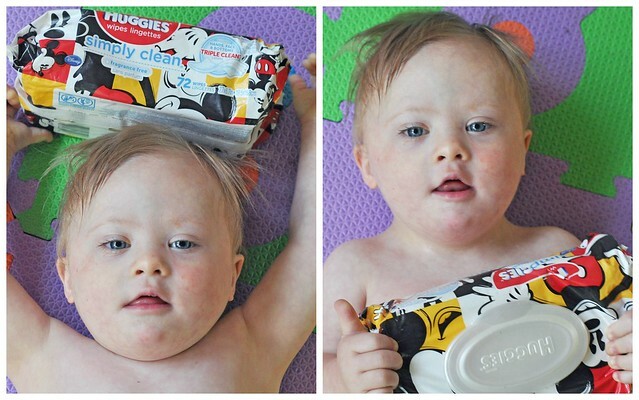 Why do I love Huggies® Wipes so much? They're really gentle. This is a must for my sweet baby. One wipe gently and effectively cleans during a typical diaper change. Blowouts obviously need more attention! The wide variety of packaging fits my lifestyle so well! The Clutch 'n' Clean hooks on to my stroller, the Designer Tub is a discreet addition to every room in my house, and the Soft Pack is great for the diaper caddy, diaper bag, and car. They also have Refills and Pop Up Tubs! Huggies® seems to be the only brand with that many options! They're NOT just for diaper changes! As a busy parent, I use Huggies® Wipes to simplify my life. They are an absolute necessity in my home and on the go! *Of course, there's the OBVIOUS use. 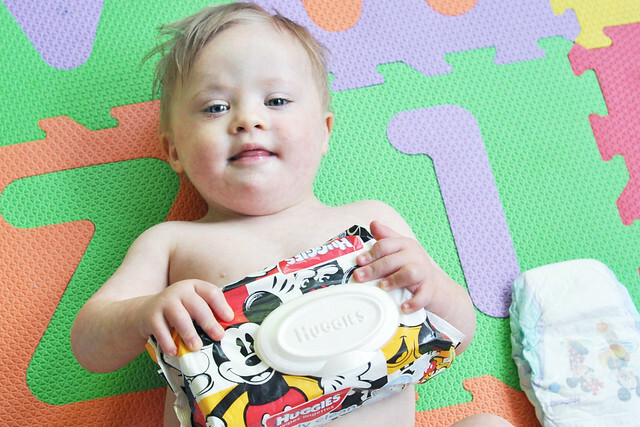 There's always a pack of wipes stashed in our diaper caddy for the MANY diaper changes! *Liam is a messy eater! I clean him up with wipes after every single meal! *Baby needs a quick bath, but short on time? Wipes! *Baby has bedhead? Use a wipe to smooth it down! *I've used wipes to remove makeup and to remove wet nail polish from my skin. *We clean with wipes, too! They're great for wiping off toys, cleaning highchair trays, dusting/wiping surfaces, and cleaning up spills! *Is your cell phone screen/electronics screen all smudged up? Use a wipe! It's one of my favorite tricks! *Wipes work great to wipe food and dirt off of clothing, and wipe dirt off of shoes. Have dirty Flip-Flop Feet after an outing? Use a wipe! *My kids and I do a messy activity together at least once a week. 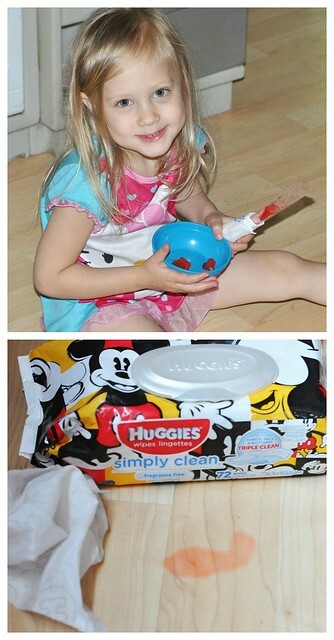 I always keep wipes next to us to clean up messy hands and spills! They also like to play with messy things and create with paint, markers, glitter, and glue. They know to grab a wipe when they need to clean up! 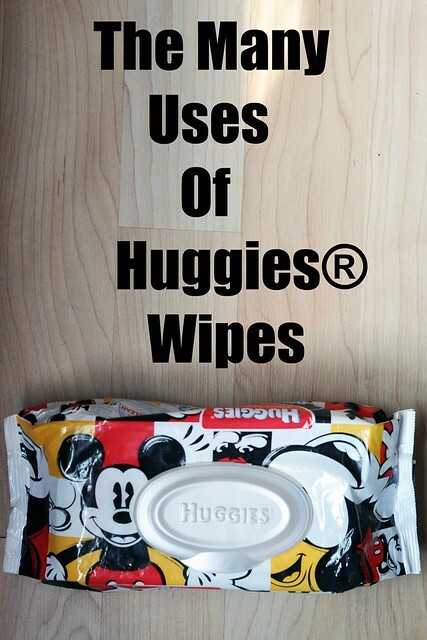 *A big pack of wipes is necessary in the diaper bag for those on-the-go diaper changes and messes. Trust me when I say there are a lot of those! *Messy Diaper Bag or purse? Use a wipe to clean it! *We keep a pack in our car at all times. The big kids always ask for wipes for sticky hands or to help clean up Liam. *Those wipes that are kept in the car are great for a quick wipe-down of the SUV's interior! It gets dusty fast! *We have many picnics at the park. I grab the wipes from my car and use them to wipe off picnic tables, wipe up spills, and wipe off hands and faces after meals! *Did you run out of hand sanitizer? Use a wipe! *We often visit a park that has a huge sandbox. The wipes are great for cleaning off sandy legs and feet before getting into the car! *A Clutch 'N' Clean is always attached to our stroller for our outings and walks. Let me just put it this way: A while back, Lily met a caterpillar in the middle of the woods and loved it a bit too much. A wipe was necessary, and I'm REALLY glad I had one! They also came in handy at our recent zoo outing. We got free ice cream and it was so hot outside that it melted all over our hands. Those wipes quickly got rid of the sticky mess from our hands, clothes, and stroller! I love having wipes easily within reach! 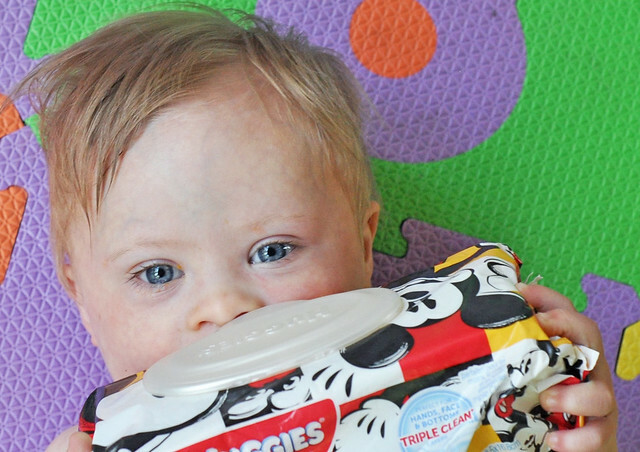 These are just a few of the many ways my family uses Huggies® Wipes! How do you use wipes in your daily life? To discover many more ways, I encourage you to check out the 101 Uses of Huggies® Wipes at Walmart video, the Huggies® Wipes Explorers video, the Huggies® Wipes Pasta Baby video (Liam is totally a Pasta Baby! 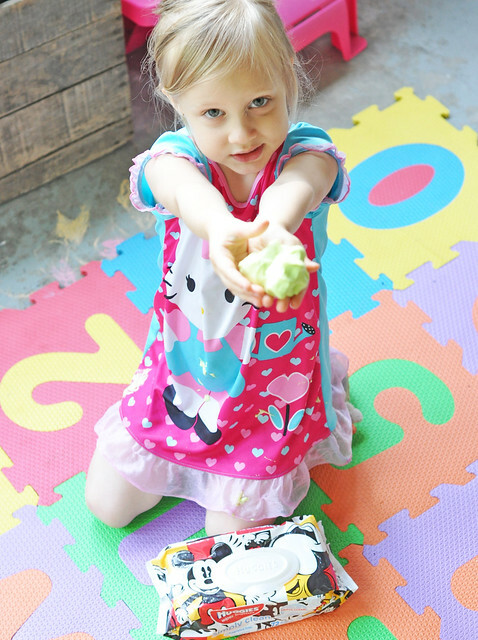 ), and the Huggies® Wipes Playtime video! With 4 kids, there are a LOT of messes to clean up. 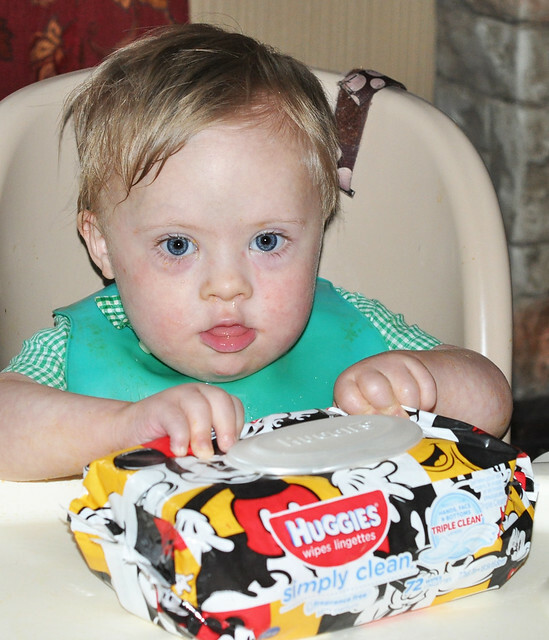 I trust Huggies® #TripleClean Wipes, and I'm sure Huggies will be with us for many years to come! Because Kids Outgrow Diapers, Not Messes*. Huggies wipes are the best! That's funny! They work well! Wow! This is Great! Thank you so much for sharing! I will defiantly use some of those!! Thanks! They definitely have a lot of uses! Sooooo I've used baby wipes in daily life since I was about 15. I like them much better than makeup wipes, so I use them to clean my makeup at night. We've also used them to dust, as glass cleaner, and they work wonders on our stainless steel sink! I've never tried them on stainless steel! Going to give that a shot! So many uses and you couldn't have sweeter babes to show that off! I don't have any babies in my house but buy Huggies wipes regularly because they're what I use to remove my makeup every night. They work well for that!!! I don't think anyone can honestly say they look forward to nappy changes, but when I need to do it, I like to know that I'm using a quality brand that nurtures, cleans and cares for my baby's delicate bits.